It seems to be very fashionable these days to be environmentally conscious. My computer and electronic usage probably causes me to have a huge carbon footprint, but at least we are using cloth diapers with Matilda! People ask me how it works so here is all the info. We use a diaper service called Tidy Diaper (tidydiapers@aol.com). They pick up and deliver 80 diapers a week for the bargain price of $16.95 a week. Thats roughly the same price as disposable diapers. You could of course wash your own diapers and then it becomes much cheaper than disposables! 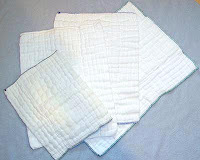 You fold them in thirds and then insert them into diaper covers. Here is a page that explains how to use them, or watch these videos. You can rent diaper covers from the diaper service, but we bought our own. We tried a few brands like Prowrap, Thirsties, Dappi, Bummis and Bumpy. Of all the covers I have tried so far, my favorite (and the cheapest) are the Dappi covers. They come in a cute pink polka dot pattern and have important features like mesh on the inside to keep the plastic lining away from the baby’s skin, leg gussets and back gathers to prevent leaks, a wide velcro area, covers on the velcro tabs and the ability to fold the velcro in for washing to prevent the velcro from messing up other things in the wash. They are nice and cottony instead of plastic-y. We also tried the G-diaper which is kind of a cool concept. Check it out. Hi, I found your blog while googling for info on NYC diaper services b/c tidy diapers came up. I hope you don’t find this message too strange, but as I’ve been researching online, I thought I’d ask someone who’s actually used the service. A few tidy diaper reivews have been less than favorable. Have you been happy with tidy diaper service and how does it work? I’m expecting my first in Dec. We have no W/D in our building so I’m not even going to kid myself into thinking I could use cloth diapers w/o a service. If you don’t mind being pestered by a random stranger, it’d be great if you could let me know how the service works. Thanks so much!